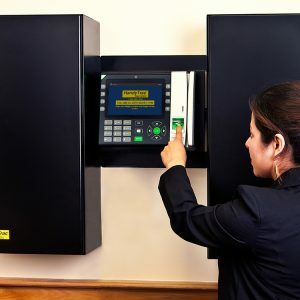 The HandyTrac Touch combines biometric technology and a large display in a single unit to offer the highest level of security, reporting, and flexibility. Instant reports showing keys out, reasons, and other transactions completed by staff. Ability to review individual work orders with one touch. Visual codes that eliminate typing errors, while streamlining the entire process. Lists units for each building, allowing for quick and easy access when pulling multiple keys. Easy to use and doesn’t require additional desktop or wall space. Ability to use bar code employee badges if desired. Built in Wi-Fi connection available. Audit Trail: Reports are backed up off site so audit trail is preserved. Long term records are archived. Hierarchy System: Allows management to easily review reports for multiple properties with a single log in. Warranty: Continuous warranty on your complete system. Technical support via toll-free 800 number. Lowest Prices: Our relentless focus on cost control and efficiency assures lowest prices. 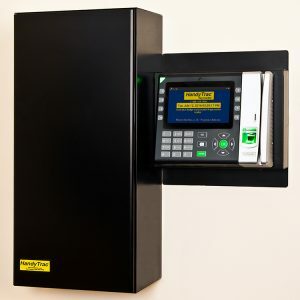 Yardi and ResMan users: Yardi and ResMan users with a HandyTrac Touch system can customize their experience through the use of a unique and secure work order system. Features like service order and staff data importation allow managers to quickly review staff data and execute assigned work orders directly via the Touch datalog.